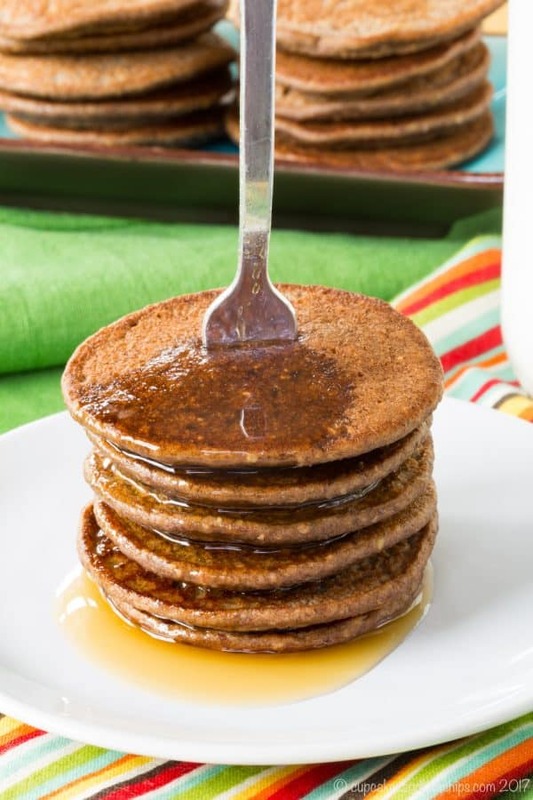 These little pancakes are a sweet and decadent breakfast, but secretly gluten free and packed with nutrition. 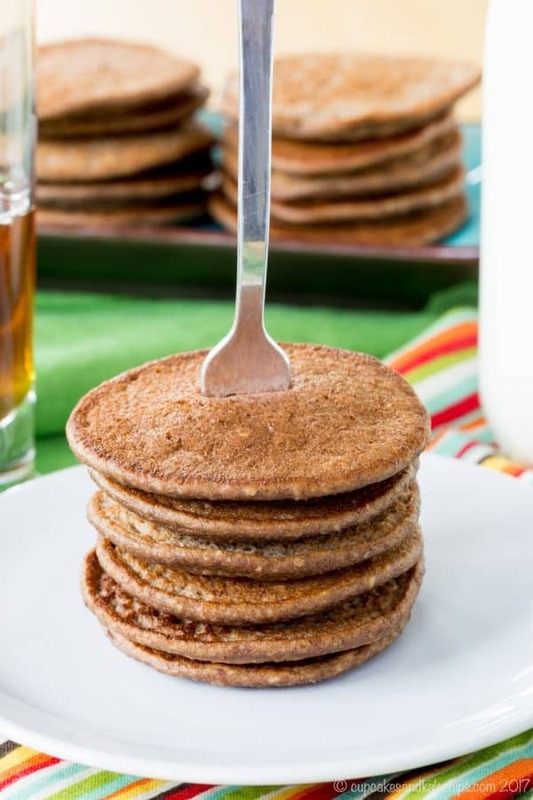 Banana oat blender pancakes are super simple, and become even tastier when you add just a bit of chocolate and more fun when you make them silver dollar-size. And don’t tell the kids, but they are healthier and naturally gluten free too. 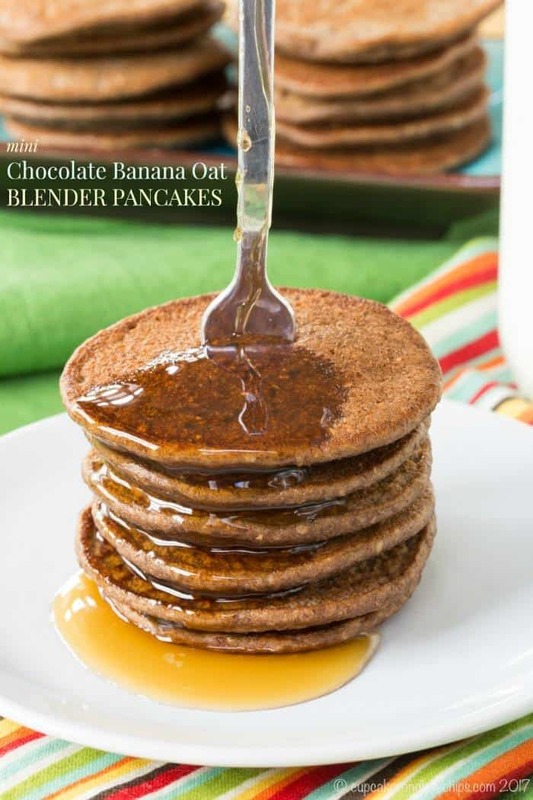 Chocolate for breakfast is good and good-for-you with these Mini Chocolate Banana Oat Blender Pancakes. I think my little guy recently realized he only has a month left to milk the “three-nager” stage. As a two year old, he had those terrible twos tantrums, but the phase was short-lived, and with it being my second time around the block, I was easily able to laugh off the nonsense, But the second he turned three, he went through that moody, sullen phase. Every single morning he had to find a reason to get mad. He would be upstairs happy as can be, but once he made it to the landing near the kitchen, his face dropped. Either I gave him yogurt for breakfast instead of cereal, or I didn’t sprinkle cinnamon on his yogurt, or I *gasp* gave him a banana. Or it would be something totally random, like he didn’t want to wear the shirt he already had on. I couldn’t win. Once he got over this, things were good for awhile. But, as I said, I think he realized he is only three for a little longer, and these shenanigans will no longer fly. So he is taking full advantage, plus employing his expanded vocabulary and thought processes. After taking the boys to church, out for lunch, and to the movies, I came home and sat down for five minutes. He wanted me to see the ship he built out of Legos. I couldn’t come immediately because I was in the bathroom. I put the honey under the granola on his yogurt instead of on top of the granola so he couldn’t see it well enough. I made French toast sticks for breakfast instead of cereal. Geez, how does he even put up with me?! 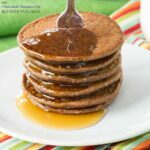 Mini Chocolate Banana Oat Blender Pancakes will certainly earn you Best Mommy (or Daddy or Grandma or Grandpa or Aunt or Uncle or Sister or Brother) status! 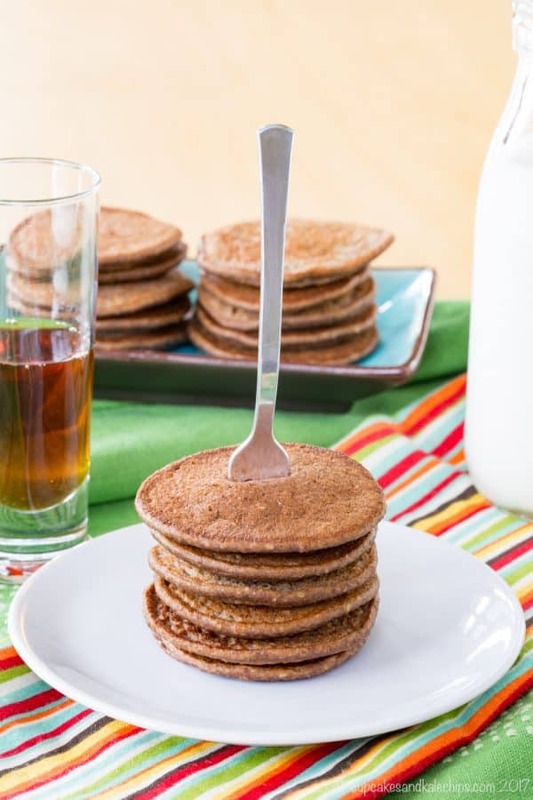 If you have overripe bananas on your counter, then you probably have everything to need to make these pancakes and enjoy chocolate for breakfast. But no guilt here because all the sweetness comes from those speckled bananas, and they are packed with oats and flax seeds. Toss everything into your blender, then just scoop them onto the pan or griddle. Since they are mini not only are they more fun, but they also cook in no time, and they even freeze well if you want to pop a few in the microwave on a busy weekday morning for a special treat. 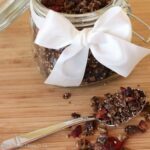 I’ve got a whole bunch of healthy ways you can eat more chocolate for breakfast! There’s Dark Cocoa Super Food Granola. This yogurt topper is packed with nutrition. The mint-lovers will adore these Chocolate Mint Smoothie. So creamy and chocolaty, you can even have it for dessert instead of a milkshake. 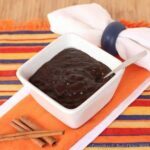 Mexican Chocolate Pudding Oatmeal starts your day with a kick. 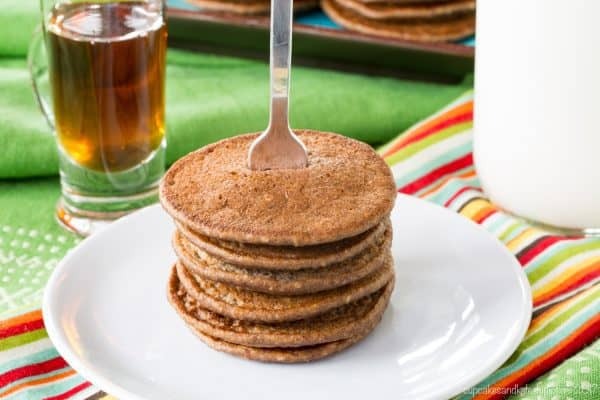 It has tons of chocolate flavor, with cinnamon, ginger, and just a hint of cayenne pepper. 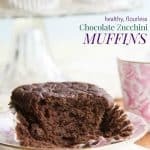 And Healthy Flourless Chocolate Zucchini Muffins are super yummy and super sneaky. They have veggies, protein, and fiber, but everyone will only taste the chocolate. Preheat your pan or griddle over medium-low heat and lightly coat with nonstick cooking spray. Scoop the batter, a tablespoon at a time (I like to use a small cookie scoop), onto the hot pan. Let cook for 3-4 minutes, or until the edges start to look cooked, and the pancakes are firm enough to flip. Flip the pancakes and cook for 1-2 minutes on the second side, or until cooked through. Serve with butter, maple syrup, peanut butter, etc. The pancakes freeze and reheat well. Wrap small stacks tightly in plastic wrap, then place in a plastic freezer back or airtight container to freeze. Sounds great and healthy but how about without the cocoa? (allergy) Make the same, substitute, or pass? Thanks!! Yes, it definitely works without the cocoa! Might want to toss in a little extra oats, and/or a little spoonful of peanut butter just for some more flavor. I can’t wait to try this recipe! My blender is my BFF in the kitchen.